Get ready to spend the night singing and dancing to the music of ABBA as the hit tuner Mamma Mia! transforms into a site-specific experience in London next spring. 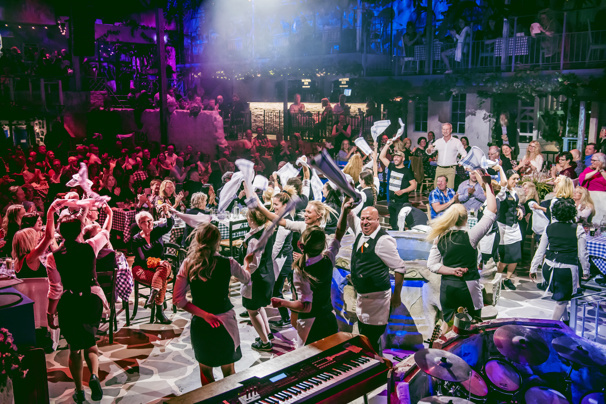 The new audience-immersive show, titled Mamma Mia! The Party, will open its doors at the London venue The O2 beginning in early 2019, with exact dates to come. In Mamma Mia! The Party, crowds will meet the taverna owner Nikos and his family. While their story unfolds, an audience of 500 will indulge in Mediterranean food and drink, with the chance to dance along to ABBA hits. Work has begun on transforming one of the venues within The O2 into "Nikos' Taverna," so guests can feel as though they are right in the heart of a Greek island paradise, sitting around tables in the taverna's courtyard complete with a fountain, olive trees and bougainvillea. The London production of Mamma Mia! The Party follows a world premiere staging in Stockholm, Sweden, which opened in January 2016. Check out footage below.